This week we are exploring the underwater world. I love the beach and all that comes with it so this is fun for me. Our first under sea creature that we made is the lobster! oh how very cute and fun!!!! oh that is too cute!!! Cool! It is a portrait of Mr Krabs! 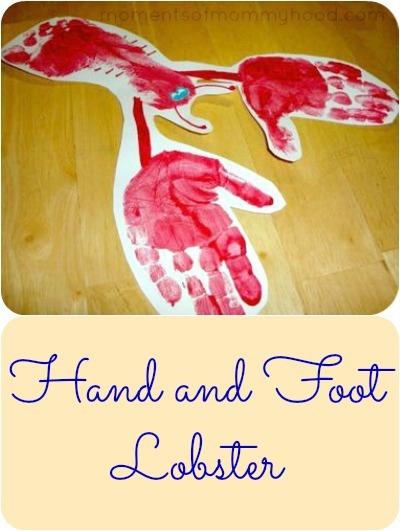 This has to be the cutest handprint/footprint craft I've ever seen! So cute! We live in MA so we have to do this one. This is so cute!!! I love this project.. Thanks for sharing! This is such a great idea! Looking forward to trying it one of these days. Oh my goodness. I love it. Have never seen this one before- adorable. Great summer craft. This is SOOO creative, I love it! I'll be linking. I love this. I couldn't picture it in my mind when I first read the title, but it really came out great. We'll have to do this one right before our trip to Connecticut. Thanks for the idea! How adorable! We did sea creature art this week too. My little boy is ready to move on, but later in the summer, I think I'm going to have to use your ideas. I LOVE this one! I have never seen the lobster. It is so cute. Thanks for sharing with Friday Showcase. great! I think we'll add that to our preschool crafts for the ocean unit! This is THE cutest!!! i am so going to have to copy this idea!!! So cute and so simple. Hope my daughter lets me put paint on her foot! You are so creative! I just stumbled on your blog through Blissfully Domestic and I'm HOOKED! :-) Thanks! That is hysterical! Was looking for an old post on one pretty thing and came across this post. Love it! What a creative idea! Love it, we'll definitely try it one of these days! OMG! So cute! I'm going to try this with my 2.5 year old!! How cute!!! Also very creative. Thanks for the idea! We made this yesterday!